Help keep the weird in Austin at the annual Keep Austin Weird Festival. Slip into your craziest costume for the "world's slowest 5K," or just gather on the lawn of The Long Center for live music, good eats and fun. Later in the evening Band of Heathens, Roxy Roca, Guy Forsyth, Holiday Mountain, Tameca Jones and Mobley will take the stage. The festival gates open at 1:30 pm. 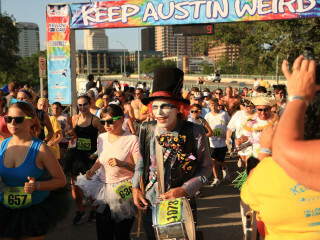 For more information on the marathon and how to get involved, visit the Keep Austin Weird website. $20-$75 for festival admission; $20-$35 for 5K registration.